If the hood is unlatched, it may open up when the vehicle is in motion and block your view. Never unlatch the hood while driving. When opening and closing the hood, it may suddenly fall into the closed position. There is a risk of injury to persons within range of movement of the hood. Open and close the hood only when no one is within its range of movement. Certain components in the engine compartment, such as the engine, radiator and parts of the exhaust system, can become very hot. 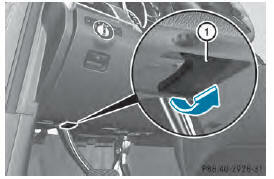 Working in the engine compartment poses a risk of injury. Where possible, let the engine cool down and touch only the components described in the following. Opening the hood when the engine is overheated or when there is a fire in the engine compartment could expose you to hot gases or other service products. There is a risk of injury. Let an overheated engine cool down before opening the hood. If there is a fire in the engine compartment, keep the hood closed and contact the fire department. The engine compartment contains moving components. Certain components, such as the radiator fan, may continue to run or start again suddenly when the ignition is off. There is a risk of injury. The ignition system and the fuel injection system work under high voltage. If you touch components which are under voltage, you could get an electric shock. There is a risk of injury. Never touch components of the ignition system or fuel injection system when the ignition is switched on. 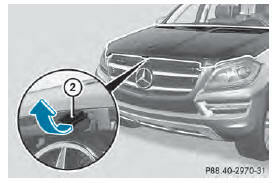 When the hood is open and the windshield wipers are set in motion, you can be injured by the wiper linkage. There is a risk of injury. Always switch off the windshield wipers and the ignition before opening the hood. Make sure that the windshield wipers are not folded away from the windshield. You could otherwise damage the windshield wipers or the hood. ■ Make sure that the windshield wipers are turned off. ■ Pull release lever 1 on the hood. ■ Reach into the gap, pull hood catch handle 2 up and lift the hood. If you lift the hood approximately 15 inches (40cm) the hood is opened and held open automatically by the gas-filled struts. ■ Lower the hood and let it fall from a height of approximately 8 in (20 cm). ■ Check that the hood has engaged properly. If the hood can be raised slightly, it is not properly engaged. Open it again and close it with a little more force. Vehicles with a diesel engine: do not cover the radiator, for example with a winter front or bug cover. The readings of the on-boarddiagnostic system may otherwise be inaccurate. Some of these readings are required by law and must be accurate at all times.